The "Saranac Firm" may be 2018's highest quality budget mattress. With the exclusive "540 Spectrum Tri-Zone" innerspring unit, it provides a very stable and durable sleeping surface. 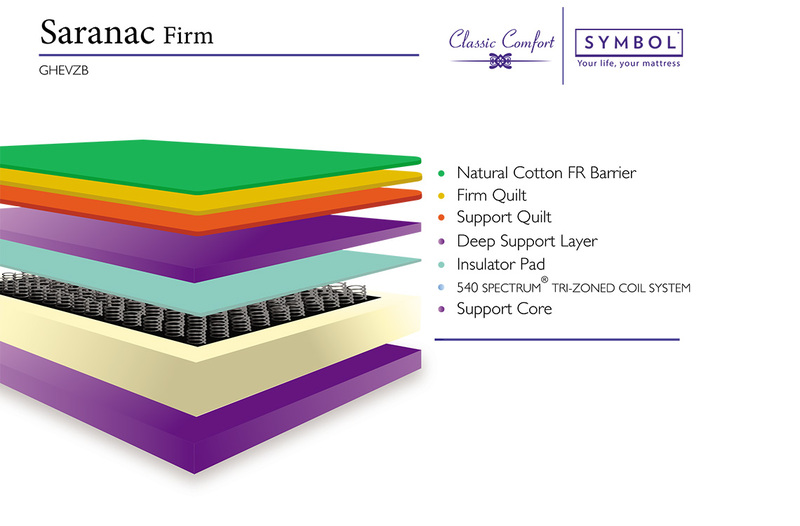 A natural cotton fire retardant layer, a foam-encased perimeter and a strengthening insulator pad are a few of the most stand-out features of this Symbol Mattress model. This mattress belongs to the "Classic Comfort" line by American manufacturer, Symbol Mattress. 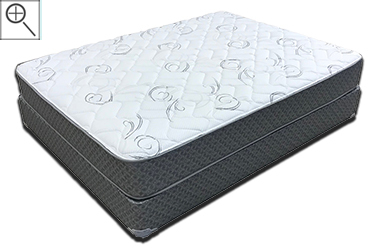 This grouping of mattresses offers a more traditional build but with an improved coil unit and Symbol's well-known CertiPUR-US foams. Mattress shopping on a budget no longer means getting the same slab of foam in a box that everyone else orders. Available in pillow top, plush, and firm feels, this model is a bit more customized to offer you the right comfort level that you're used to, and that you require in order to achieve a great night's rest on a budget. Symbol's "Classic Comfort" line offers up a great night's sleep for a low cost. For many years, this manufacturer's "Cavalier" line of mattressses was one of the best sellers in this price range. For 2018, they've improved upon the design of those models and included the "Spectrum" zoned coil unit. This exclusive inner spring reduces motion transfer and 'sway', providing a much more stable feel and likely adding to the overall longevity of the mattress. Despite having some more modern features, this is a great bed for those who are looking for a 'basic' or 'old school' feel. Medium-Firm in feel, it won't sleep like a brick but it'll offer plenty of durability and reliable comfort for nearly anyone. These days, it's quite difficult to find a 'real spring mattress' that is available at an affordable rate. The"Saranac Firm" is the exception to this near-rule and gives a lot; dollar-for-dollar. Students and others who are shopping within a tight budget do not always have to order the typical 'bed in a box' that gives a minimal amount of comfort, usually for a short term period. The Saranac mattresses make it possible to get something more traditional - and probably longer lasting - for an even lower cost! A simple but comfortable and budget friemdly mattress model.